Happy Solemnity of Mary, Mother of God! Happy New Year and Merry Christmas (still!!!)! This morning my husband and I went to Mass for this holy day of obligation that always falls on January 1st. We are still smack in the middle of Christmas season and we celebrate Jesus Christ through His mother. She is the Theotokos, mother of God (both his divine and human natures). Our priest gave one of those homilies that made me feel like it was meant for me. 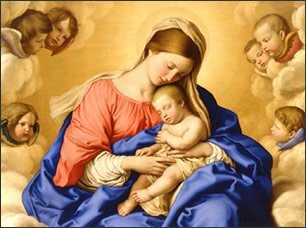 He did not focus so much on Mary, but on new starts and moving forward on the path to holiness. If anyone can show me the way in my vocation, it is Our Heavenly Mother. You see, 2013 was a very rough year for me. It was filled with grief and loss, medical emergencies, bills, anxiety, depression, and stress. I woke up this morning and thought, “I survived 2013”. I might make a t-shirt. Okay, not really. Our priest said that we must put 2013 behind us. We must leave the bad and bury it. We can take the good from 2013 and use it to help us on the path to Sainthood, but the bad, it must go. We must also look at our failings in 2013 and figure out how we can improve in 2014. What is it that I need to do better in this year that God has given me? And, yes, I was so grateful to be here for 2014, when so many are not. I am not talking about resolutions that lead us to 3 month fitness club memberships that we abandon. I am talking about our sins. The ones we hold onto so tightly. We must learn to let them go. God has given each one of us another day to be guided in His loving correction. I fail daily. As Father gave his homily, I asked for God to make me a better wife and mother. I am finding that my primary vocation is deeply difficult, but comes with great joy. My secondary vocation of Lay Dominican, only strengthens my first through prayer. There are things about myself that are not pretty, but God’s grace “can make me white as snow”. So, yes, 2013 still hurts. I miss the baby I lost and the friend I lost, but 2013 increased my prayer life, especially an awareness of how much we need to remember to pray for the dead. Losing people I love has shown me that my love for them does not die because they are behind the veil and I am not. I think of them during Mass when I partake in the Heavenly Liturgy. I think of my babies when I see another child in a mother’s arms. I pray for the dead each time I pass a cemetery. So, in a way, my grief has strengthened my resolve and understanding that this is not the end. Even though 2013 was one of the hardest years of my life, as always, God has used it for His good. I pray you have a very blessed 2014. Where are some areas that you need to improve on your path to holiness this year? I am asking for grace to love more. Not just loving my friends and family more, but also the unlovely and those who are my enemies (by their speaking or acting against me or any of my brothers and sisters in Christ). I have far to go in this, but God is patient, and He will be faithful to complete the work He has begun in me. Blessings upon you and yours for 2014! The grace to love more. I need that too! I pray for strength and wisdom for you as your continue your journey in 2014. Let’s hope both of our families get a bit of a break from hospitals. How is Sydney doing? Thank you so much for the blog awards! I need to think about who to give the awards to. God bless!